You can happily spend a whole day in Argyroupolis. Here, you can easily do ecological shopping, dine on wonderfully fresh trout and, above all, experience at first-hand how many a Cretan village today was once a town of much greater significance in antiquity and the Middle Ages. The village now only has about 400 inhabitants; 2000 years ago there were around 10,000. The name of the village means 'Silver City' - but the reason why is a mystery. We recommend that you first drive right into the village centre, with the village church built in 1895 together with a filigree bell tower. You will easily find parking spaces there. Opposite the church you will see an arched gateway: the main entrance to the historic village centre. The shop 'Lappa Avocado' has established itself on either side of the arched gateway. In 1984 a farming family started to cultivate the exotic fruits here, and planted the first 500 trees. Since the sale of the foreign fruits in Greece was sluggish, in 1996 the family struck upon the idea of making avocado oil, from which they developed cosmetics, especially for unhealthy and highly sensitive skin. Their success has continued to this day, and they now have over 2,500 trees. The small kafenia opposite the arched gateway has other ideas for using the avocados: they serve them with creamed tuna, scampi or honey and yoghurt, use them in salads and press them to make avocado juice. Moreover, you can get a small map of the historic village centre free of charge in the avocado shop and the kafenia. It leads you to various sights, which you can walk around in about 20 minutes. Two of these sights are particularly worthwhile: firstly, the small Agia Paraskevi church down to your right at the end of the straight main street. If you descend the stairway from the street to the churchyard, be careful where you tread: one of the steps is the cover of the ancient sarcophagus of a child, a marble child's coffin. Incidentally, the word 'sarcophagus' means 'flesh eating'... There is also an ancient column towering up above head height in the churchyard. The remains of other columns are lying around the churchyard. They come from the ancient city of Lappa, the settlement that preceded Argyroupolis. It was founded around 2,800 years ago and was one of the most important cities on Crete, especially in Hellenistic and Roman times. You will see several icons of Saint Paraskevi in the small church. She carries a pair of eyes on a small dish. The saint is an early Christian martyr from Cyprus, whose was blinded because of her faith. Today, she is considered an intercessor saint for the healing of eye ailments. Numerous shining silver votive tablets with a pair of eyes testify to the fact that believers with visual impairments still turn to her today. The second main sight in the historic village centre are the remains of a colourful Roman floor mosaic. Go up the street straight to the left of the avocado shop, and you will be there in two minutes. It may only depict a geometric pattern, but it testifies to the wealth and lifestyle of the former city inhabitants around 1900 years ago. After this tour you might be feeling hungry. Drive towards the north coast and turn left downhill before you reach the end of town. After a few minutes you will arrive at several tavernas in a heavily forested section of valley. Ten gushing springs originate here, providing some of the drinking water for the city of Rethymno. Several water mills used to be situated here. You can still see the remains of one of these mills in the 'Palios Mylos/Au Vieux Moulin' taverna. Today, all of the tavernas in this location serve trout that has been bred in the spring water - and recently they've also started to serve sturgeon imported from Russia. Those who don't like fish, however, will also find liver of lamb and meatballs on the menu, for example. Spring water is always served free of charge. After this refreshing break, drive back to the village and turn left onto the road leading to the north coast. You will soon drive past the large, modern 'Creta Carob Store'. One member of the family that cultivates avocados restarted the commercial use of carob trees in Argyroupolis several years ago, which grow prolifically in Crete. You can now buy produce from the long, brown beans of this tree here: replacement coffee, cocoa and tea, honey, syrup, flour, rusk, biscuits, pasta - you will be amazed at all the things you can make from carob! Straight after, a street branches off down to the right towards Kato Poros. After 400 m you will see a brown sign on the street saying 'Church of the Holy 5 Virgins/Cemetery of Ancient Lappa'. Leave your car here and follow the sign on foot along the well-made path, which takes you past lemon and orange trees. After just 100 m you will see the first ancient grave to your left in the low rock face. 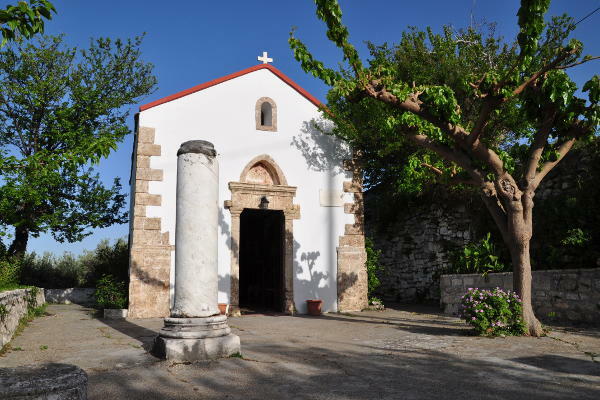 Another 150 m further on, you will reach the small chapel of the 5 Holy Virgins. In the forecourt and on the rock face behind the church, you can see numerous other tombs cut into the rock, and you can even go inside. They date back to the 300 years between approximately 100 B.C. and 200 A.D. and are part of a much larger graveyard belonging to the ancient city of Lappa. A holiday destination for bathing enthusiasts, nature lovers, hikers, and those interested in history and culture. Today, Crete is one of the most popular tourist destinations in the Mediterranean - cosmopolitan and mysterious at the same time. The Corissia Hotels are situated within the tranquil, picturesque village of Georgioupolis right on the sandy beach. An ideal seaside resort both to relax and explore the island, because that is just what holidays on Crete are all about.